View of the World from 9th Avenue is a classic map/illustration showing how New Yorkers see the rest of the world. 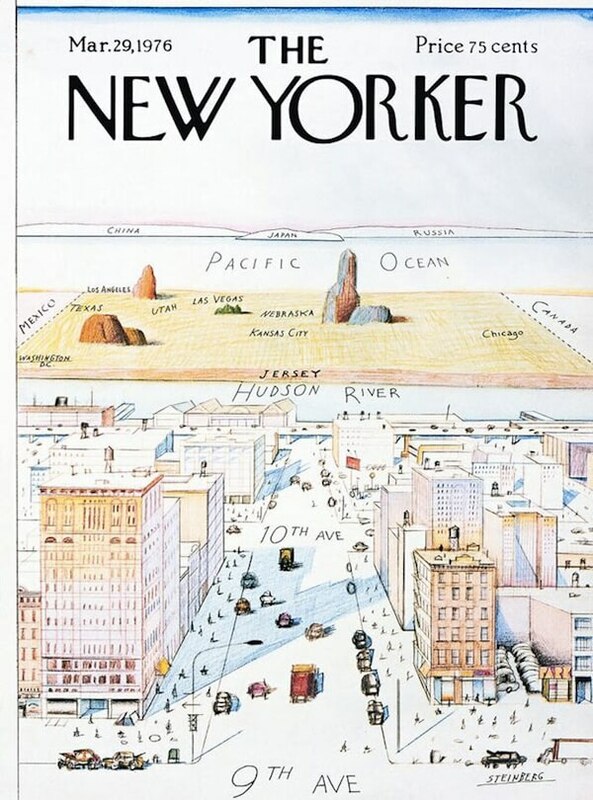 Designed by Saul Steinberg, it was first published as the cover for the March 29, 1976, edition of The New Yorker. The map shows how New Yorkers might see the rest of the world if they faced west on 9th Avenue. Thus, 10th Avenue and the Hudson river are clearly shown, but beyond that it’s just a bit of a blur. Canada and Mexico both make it onto the map, sandwiching a very rectangular United States. In total 5 cities beyond New York are included: Washington DC (near Mexico), Los Angeles, Las Vegas, Kansas City and Chicago. Texas, Utah and Nebraska also make it onto the map. Also, Jersey is included just beyond the Hudson, but is nothing more than a strip of land. The rest of the United States don’t even warrant a mention. Beyond the United States, you have the Pacific Ocean and then Japan, China and Russia. Interestingly, there’s no mention of Hawaii in the Pacific or any European country. The westward focus is prescient of the emergence of China as a superpower vs an eastward focus on the Soviet Union, the superpower of the day. The map/illustration has spawed a whole host of parodies, some of which have been collected in this album, via reddit user offensive_noises. It also resulted in a lawsuit, when Saul Steinberg sued Columbia Pictures over the use a similar image in the original poster for Moscow on the Hudson. Unfortunately, Saul Steinberg died in 1999 (aged 84), but you can learn more about his work from The Saul Steinberg Foundation. Fortunately, The New Yorker is still going strong.